St Johnstone defender Richard Foster has been banned for two matches for kicking a referee’s door. The Scottish Football Association found the 32-year-old guilty of “excessive misconduct” after the 3-2 defeat at Dundee last month. Sofien Moussa scored the winner from the penalty spot at Dens Park after referee Alan Muir ruled that Foster had fouled AJ Leitch-Smith. Foster’s ban means that he will miss the Scottish Premiership home game against Rangers on October 13 and the trip to Hearts eight days later. The former Aberdeen and Gers full-back also served a two-match ban and was fined by the club last season for scuffling with teammate Danny Swanson during the 0-0 draw at Hamilton Academical in April. Just a reminder that the Society’s first meeting of Season 2017-2018 will take place this Monday 21st of August at the Ford Club, Treboeth, Swansea to commence at 7.30pm. Prior to the Society’s meeting, the Swansea Senior League were to hold a referees get-together at 6.30pm but this has now been cancelled due to the General League Secretary and the Leagues Referee Officer both not being able to attend. This will be rearranged for a later date. Referees wishing to register with the Swansea Senior League will be able to do so; forms will be available on the night. On behalf of our Chairman, Mr Alan Gray and myself we look forward to your attendance. Cristiano Ronaldo has been banned by Spanish authorities for five games after pushing the referee in the back, after he was shown a second yellow for diving in last night’s El Clasico. He has received a one game ban for his second yellow and red card and a four game suspension for pushing the referee, he has also been fined €3,805 for his actions. Although the suspension might be reduced to a three game ban as the second yellow that the Portuguese winger received looked to be harsh as replays show that there was contact between him and Samuel Umtiti, even if that contact was minimal. I have attached the new disciplinary reporting procedure which come into effect immediately. Please read carefully and follow the procedure set out in the letter. E Mail roger.wwfa@hotmail.com. Telephone 07970 036496. You can down load the disciplinary reports from the WWFA web site: www.wwfa.org.uk / Referees. Please find attached the documentation for the forthcoming Swansea Referees Society April meeting and Annual General Meeting to be held on Monday 24th April 2017 at the Ford Club, Treboeth, Swansea. Please note that there are three tabs within the Annual Accounts year ending 31st March 2017 document, please ensure that you download this document to ensure that all three tabs are visible. 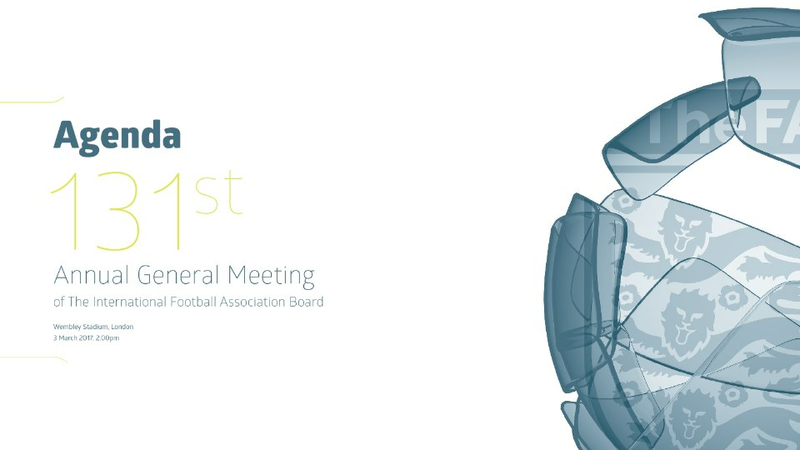 The 131st Annual General Meeting (AGM) of The IFAB will take place at Wembley Stadium on Friday, 3 March and will be chaired by Greg Clarke, Chairman of The Football Association. Following last year’s major revision of the Laws of the Game which made them easier to understand and more consistent in their interpretation and application, this year’s AGM will be asked to approve final ‘tiding up’ to assist translation and interpretation of some of the changes of the Laws of the Game introduced in 2016. This will represent the final stage of the overall major textual revision of the Laws. Additionally, as part of “Modifications”, the proposal to allow temporary dismissals (sin bins) in youth, veterans, disability and grassroots football for yellow card offences will be considered following tests in UEFA’s development competitions over the last three years. On the topic of video assistant referees (VARs), the AGM will receive updates on the completion of the first phase of experiments including reports from the workshops held and more than 20 test matches organised to test the VAR protocols which were approved one year ago. The AGM will receive detailed information on the key learning areas which will be incorporated into the ‘live’ experiments which will start in almost 20 competitions from around the world in 2017. The IFAB’s overall strategy will also be discussed., It ranges from expanding football’s philosophy of fairness to ensuring that ideas for development of the game are considered, tested and introduced in the right way and for the right reasons as well as embracing relevant and supportive technology. Central to the strategy will be even closer relationships and exchanges with football stakeholders to ensure The IFAB’s proposals and decisions relate to “what football wants”. Particular focus will be given to the role of the captain and how her/his responsibilities could be enhanced as part of a move to improve on-field discipline and create better communication between players and match officials. Additional agenda items include an update on experiments with the Law 12 change to the punishment for some denial of a goal-scoring opportunities as well as 4th substitutes in extra time; both changes are currently being trialled.